Lap Pool: 25-yard, 6 lanes · Depth: 3 to 6 feet · Hydraulic lift and access stair. Comfort in the water and learning to be safe in and around water are skills for life. At the JCC, aquatics are among the most important services we provide. So come for a swim or water workout, enjoy the water with your kids. It’s all here for you! Come work at a great place: The JCC is seeking part-time lifeguards/group/private swim lesson instructors! All applicants are required a minimum of 1-3 years swim instructor experience. Applicants must have up-to-date American Red Cross Lifeguarding, First Aid, & CPR/AED certifications. Water Safety Instructor Certification (WSI) is preferred. A free health membership is offered upon hire. All candidates must possess or obtain Act 33/34, FBI clearances, and mandated reporter training. Be a part of our non-competitive swim group. Learn swim team skills such as diving, endurance, and efficient stroke technique in a fun, relaxed environment. Exercise, socialize with friends and discover what you can achieve. Swimmers are required to attend both days per week and must be able to swim 25 yards freestyle, backstroke and breaststroke and 10 yards butterfly. instructor will help their child learn to float and blow bubbles. Parents will also learn basic safety and swim skills to be comfortable with their child in the pool. Introduction to organized swim lessons for ages 2-4 years old. Parents do not get into the water. Children will learn to put their face in the water in order to swim forward unassisted. They will also learn how front/back float with assistance and kick on their front/back. Goldfish (Level 2) Children will learn how to front/back float without support and combine alternating arm and leg action on their front. They will kick on their back unassisted, tread water 15 seconds and front streamline one body length. Children learn how to swim freestyle 25 yards, backstroke 25 yards, elementary backstroke 10 yards and breaststroke 15 yards. They will tread water for one minute and be introduced to diving. Your child will learn to swim freestyle 50 yards, backstroke 50 yards, breaststroke 25 yards and butterfly 15 yards. They will also be introduced to flip turns and racing starts. Call to schedule for one-on-one instruction. Our heated pool is the ideal environment for relieving arthritis pain and stiffness. Gentle movements increase joint flexibility and range of motion, while restoring or maintaining muscle strength. Must have a physician’s referral to participate in this certified program. This water-based high intensity interval training challenges your whole body while also improves your coordination, endurance and power. Jump in for a fun, shallow water class that improves agility, flexibility and endurance. This is a great low-impact option. No swimming ability is required, and a SilverSneakers® kickboard or other aquatic equipment is used to improve strength, balance and coordination. 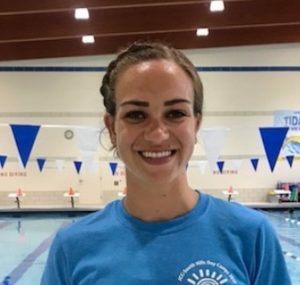 Adult Swim Lessons: For adults who have limited swimming experience or who are able to swim but want additional help with stroke technique. You must be able to swim 300 yards continuously: 100 yards front crawl, 100 yards breaststroke, 100 yards either front crawl or breaststroke, surface dive and retrieve a 10-lb brick, swim with brick to the shallow end of the pool. This class is designed to help you pass the prerequisite swim test given on the first day of lifeguard class. Call for dates. Recertification class includes lifeguarding, first aid and CPR/AED. Must have a current lifeguarding certificate. I started at the JCC as a lifeguard in 2003 and in 2015 became the Aquatics Director. My daughters Carly and Natalie both swim, dance and attend preschool and summer camp at the JCC South Hills. 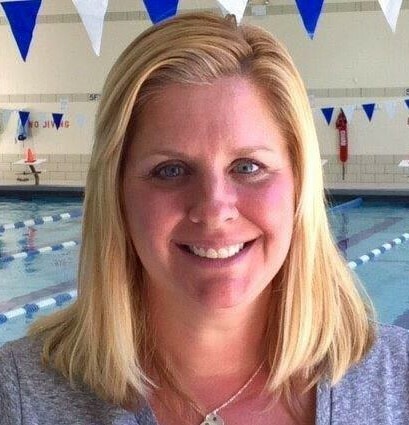 Natalie has been teaching swim lessons for six years and swam competitively for 16 years. Stephen has been teaching swim lessons for 15 years, for all ages and skill levels. 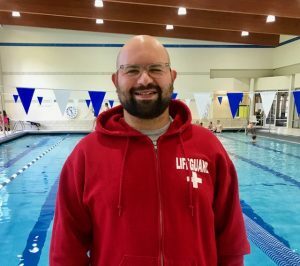 He also has experience with community and intramural swim programs.